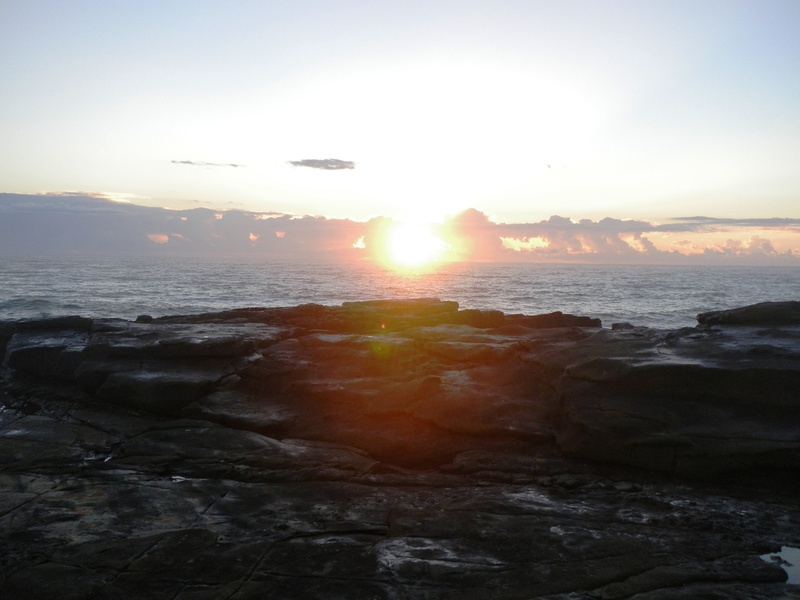 I have just got back from a week fishing the rocks at Iluka in Northern New South Wales. The weather was fantastic with only a couple of showers and very little swell, the whole week. For the beginning of the week we had early morning low tides, which also made it possible to fish some usually inaccessible spots. The week produced some great fish, as you will see. I started on Monday morning at Middle Bluff in the Bundjalong National Park, just north of Iluka Bluff and Frasers Reef. I arrived around 5.00 am and faced a mild swell and a very light northerly wind. Low tide would be at about 7.00 am. I watched a few big waves slap over the rocks and decided to wait for better light to start fishing. At about 5.30 am I could see my feet and had got a feel for the wave pattern, so I started casting. I bought a new rod for this trip – the Daiwa Demon Blood 9ft 6. The Rovex Bario 12ft and Aureus 9ft have served me well, off the rocks, but I needed a rod with a faster action and more sensitivity when casting lighter weighted jigheads. I also broke the 9ft Aureus while landing a decent Jewfish a few months back and although Rovex backed the rod with a replacement straight away, I have lost a bit of confidence in it. The Daiwa is a much pricier rod but it is really light and should also be able to lift big fish – we will see. I started with a GULP Crazylegs Jerkshad in the Satay Chicken colour rigged on a 3/8/ 3/0 jighead. I was using my Shimano Stradic 8000, loaded with 20lb Fireline and about 2m of fluorocarbon leader. I join the mainline to the leader with a uni to uni knot. The first half an hour produced nothing. I used a few other large plastics in fairly bright colours but nothing got a bite. It had been raining on and off, for about three weeks before we arrived and the Clarence River was pumping out a solid stream of sediment. As a result the water was very murky and got dirtier as we approached low tide. At about 6.00 am I decided to put on a GULP 4” Minnow in the Vader colour – this has a black back and crème coloured underside. On my second cast it was grabbed close to the rocks. There were plenty of head shakes and then a decent Tailor leapt clean out of the water as it tried to shake the jighead from its jaw. The swell helped wash him up the ledges and after a short fight, I had him safe at my feet. It was a great way to christen the new rod – a 55 cm Tailor. I bled the Tailor, dropped it in a rock pool and cast out the rather mashed Vader Minnow again. Before I had lifted the rod tip – bang – a fish grabbed the lure and took off. It was a good size and peeled line for 10 seconds or so before – ping – it snapped the leader on a rock. I was out of Vader Minnows so I switched to a 4” Minnow in the Rainbow colour. This soft plastic is very similar to the Vader pattern but with a slight silvery sparkle on its underside. 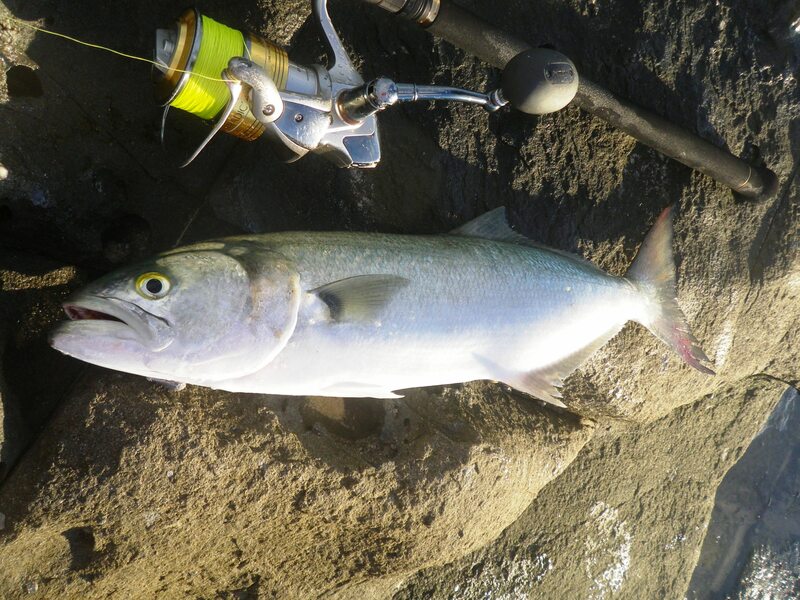 Second cast and I was on again this fish gave me plenty to think about by lodging itself down low in the rocks. I loosened the drag and as the line wafted free of the rocks I thought I had lost the fish. I started to wind in and bang – it was off again. This time it did not have much strength and with the next big wave I had it up on the rocks – another good Tailor at about 60cm. I fished on for another hour or so through the tide change without another touch. I gave up around 8.00 am and headed home. A great start to the week. 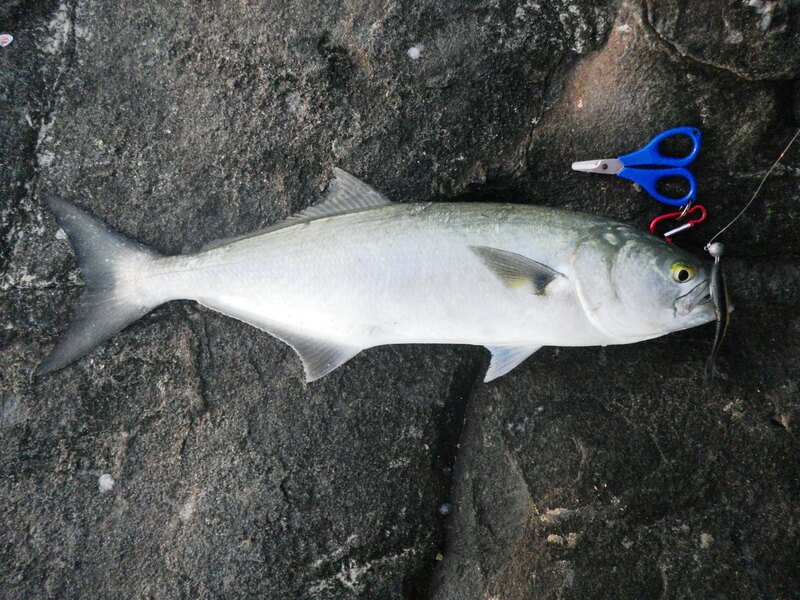 This entry was posted in Fishing Reports, Iluka and tagged Australia, catching tailor on plastics, fishing for Tailor, fishing for tailor at Iluka, fishing for Tailor with soft plastics, fishing from the rocks with soft plastics, fluorocarbon leader, GULP, Iluka, land based, land based fishing, Northern New South Wales, rock fishing, rock fishing in Northern New South Wales, Tailor. Bookmark the permalink.